Reptiles should generally be bright eyed, alert and without deformities or unnatural bends or kinks in the legs, tail, spine or jaw. Unnatural bends could be a sign of congenital deformities, serious injury or inappropriate nutrition. The animal should have no retained shed (i.e. no old skin still attached to the toes, face or anywhere else on the body) as this may be an indicator of poor husbandry and/or ill health. All toes should be intact, as should the tip of the tail. Loss of these body parts may indicate that the animal did not successfully shed, resulting in the remaining skin constricting blood flow and causing serious damage to the aforementioned areas. There should be no mucus or bubbling around the nose or mouth as this can be a sign of a Respiratory Infection or Mouth Rot. Avoid dull and emaciated animals and lizards that are unable to raise their belly off the ground. Adults of certain gecko species (such as the African Fat Tailed Gecko and the Leopard Gecko) should have a plump tail as this is a good sign that the animal is eating well. Preferably avoid buying juveniles which have been housed on sand as impaction is quite common with young lizards housed on this form of substrate. 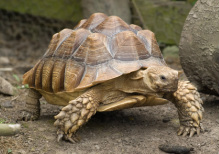 With tortoises, pyramiding of the shell (referred to as Pyramidal Growth Syndrome or PGS) is a clear sign of poor nutrition and management. Pyramiding occurs when the scutes of the animals shell begin to take on the form of a pyramid. The cause for this condition can be attributed to feeding excessive protein, inadequate calcium, low fibre and other dietary excesses or deficiencies. A wild tortoise’s natural diet tends to be much lower in protein than what is often fed to captive tortoises. They’re natural diets are also very high in fibre so efforts should be made to mimic these diets in pet tortoises by including plenty of grasses and grass hay within their feed. Excessive feeding may also be a contributor to pyramiding as well as insufficient exercise, inadequate humidity and insufficient water. Dysecdysis in chelonians occurs when the old scute is retained and unable to shed properly. The condition is associated with poor husbandry, and may occur if the turtle has not been able to dry off or bask sufficiently to lose its old scutes. Retained scutes often become infected. The general public tend to view turtles, tortoises and terrapins as indestructible, hardy pets. Unfortunately, this incorrect perception has caused these animals to be amoung the most neglected reptiles maintained in captivity. The reptile should not be overly stressed when handled, although some species such as the Green Anole are generally very shy and do not take well to handling. Some pet shops will intentionally cool the animal before letting it be handled, the cooling of the reptile calms it down by slowing down its metabolic activity though it may become aggressive once warmed up to its optimum temperature. Reptiles should not be made calm or immobile through cooling, this has serious welfare implications. A stressed animal can also mean an ill animal as stress often compromises the immune system. Do also look out for any damage to the skin, small lacerations on the body could be evidence of previous tick infestation. Wild Caught reptiles often harbour ticks which are sometimes removed by the pet shop. It is best to avoid reptiles which are potentially carrying parasites and to also avoid wild caught animals as they tend not to make good pets for various reasons. It is important to make sure the animal you acquire is healthy to avoid costly medical bills or early upset if the animal regrettably passes away soon after purchase due to poor previous living conditions, as has been the case for many people. Be aware that there are unscrupulous breeders and unreliable pet shops out there which are not terribly concerned about the welfare of the animals they sell or are not educated enough to care for them properly. Do find out the indicators of health and illness in the species you wish to acquire before purchasing as it will be most helpful when picking out a happy healthy pet. Girling S., 2003. Veterinary Nursing of Exotic Pets. Blackwell Publishing.